Circa 1890s-1900. 1/6th plate. Private Collection. These romantic four got their picture taken on rocks in the outdoors. There’s such a positive, happy vibe to them. Though they are in nature it looks like they may have been at a city park, or at least near civilisation. They’re dressed city-like with bowties for the gents and white dresses for the ladies. My guess is they attended a happy semi-formal occasion and a photographer was hired to take pictures of the attendees. I like seeing pictures of gents with their hat tilted far back. 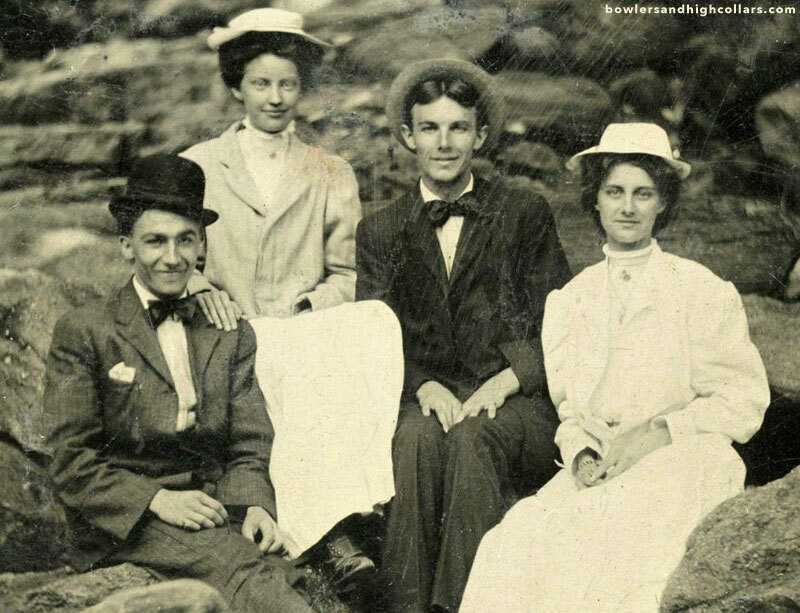 The one with the bowler looks like he’s cracking up about something. I love it when everyone smiles on tintypes. The ladies are gorgeous too. The guys are probably feeling lucky! This entry was posted on Thursday, May 7th, 2015 at 12:51 am	and tagged with 1890s-1900s, beautiful couple, bowler, edwardian, Edwardian dress, romantic, smiling and posted in Groups, Tintypes. You can follow any responses to this entry through the RSS 2.0 feed. I agree they do look as if they’ve just had a great day out, another lovely picture. Lol! He does have the same smile!